As part of our premiere of Proto-type Theater's new show and to open Adulterated Tales Festival, we're delighted to offer a rare late-night showing of the amazing film Grey Gardens. This event is free to ticket holders to Proto-type Theater's Virtuoso (working title). Behind the walls of a once-grand East Hampton home, we meet Edith Bouvier Beale and her daughter, 'Little Edie' – high society dropouts, reclusive cousins of Jackie O. - thriving together amid the decay and disorder of their ramshackle East Hampton mansion. A most intimate portrait of the unexpected, an eerie echo of the Kennedy Camelot, Grey Gardens has become a cult classic and established Little Edie as fashion icon and philosopher queen. 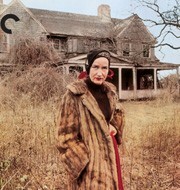 Grey Gardens (1976), a film by David Maysles, Albert Maysles, Ellen Hovde, Muffie Meyer, Susan Froemke, color, 94 mins.